Research shows that the most effective way to teach spelling is through an active word study of patterns. 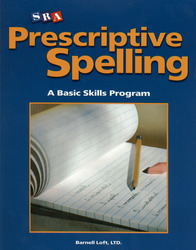 This is a direct and systematic way to teach spelling skills to all levels of students. Skills are taught in the context of sound spelling patterns, meaning patterns, and visual patterns. Prescriptive Spelling is designed to evaluate spelling abilities, diagnose specific difficulties, provide instruction and reinforcement, and correct even serious spelling problems.